Running for hundreds of kilometers through beautiful Canadian Shield back-country, the Bird River is the quintessential trip for both beginner and expert Canoeists. Swapping back and forth between lakes and the winding river, this route gives a taste of everything that Manitoba’s Nopiming Provincial Park has to offer. The river takes you past powerful waterfalls and rapids while it winds through the steep rocks and beautiful spruce forests of the Canadian Shield. There is exhilarating cliff jumping as well as many excellent fishing spots throughout the route. Join us this summer on the Bird River! Price is all inclusive, including transport from Winnipeg, all equipment, food, and professional guide. Having gained some infamy last year after an unfortunate encounter with some German tourists (See here for all the details), the Hayes River stands out as one of the wildest rivers in Manitoba. Shooting through northern Manitoba with Class III & IV rapids this is not a beginner route (As the tourists mentioned above learned pretty quickly). An experienced paddlers dream, the Hayes will challenge just about anyone with it’s length and difficulty. Paddling the Hayes comes with the added bonus of getting to visit York Factory, one of Canada’s most important yet least visited historical sites. The Seagrim Lake Chain is the ultimate beginner trip. Even if you’ve never touched a paddle or slept a single night in a tent, this route will ease you into the wonderful world of canoe tripping. Located in the picturesque Nopiming Provincial Park, the Seagrim Lake Chain is a series of small to medium sized lakes with short portages connecting them. Beautiful towering cliffs border the water and our favourite campsites are located on massive island outcroppings of rock. With shorter days of paddling and calm lakes, this route will convert anyone into an avid canoeist. This is on of our favourite routes and you can book for our 2018 season now! With weekly Friday departures all season long, we’d love to have you! Price is all inclusive, including transport from Winnipeg, all equipment, food, and professional guide. 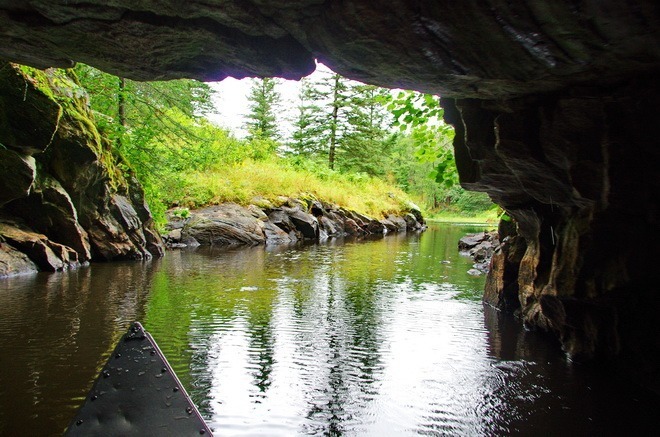 Paddle through rocky tunnels carved into the Whiteshell landscape by railroad workers decades ago on this beautiful weekend trip. Caddy lake is an excellent, quintessential Manitoba route. It’s one of the most accessible routes in Manitoba, only a couple hours east of Winnipeg on highway 1. 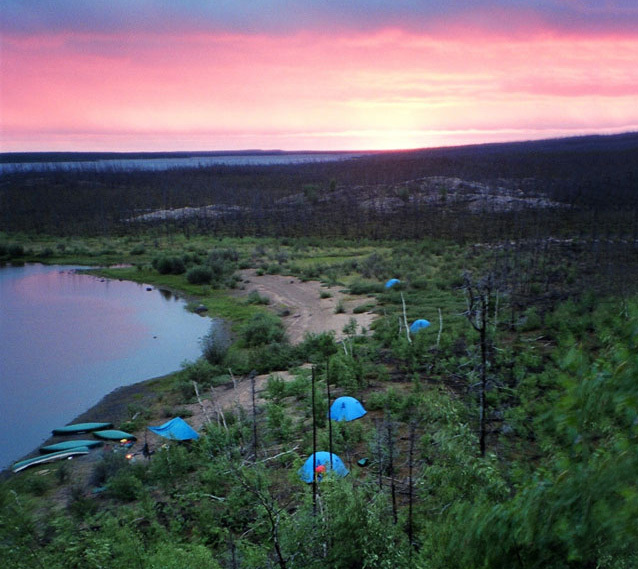 With many beautiful island campsites clustered along the route you can make this a quick one-night trip on any weekend. Easily the best route in the province for the busy canoeist, pack up Saturday morning and be home by dinner on Sunday. One of Manitoba’s most famous canoe routes is a whitewater paddlers dream. The Manigotagan is a beautiful and exhilarating journey through rushing whitewater and gorgeous waterfalls. The Manigotagan is the perfect trip for the intermediate canoeist who wants to get into the world of whitewater canoeing. With the majority of rapids being Class I & II, the river allows you to flex your canoeing abilities at your own pace. Portages are available at every rapid so if you are uncomfortable there is always an opportunity to take it easy. Twin River Travel will be offering the Manigotagan as our first whitewater route in 2018, click the link below to book now. Price is all inclusive, including transport from Winnipeg, all equipment, food, and professional guide. Flowing through the tundra of northern Manitoba the Seal River is easily the most unique and special route in Manitoba. The Seal River is the holy grail of many Canadian canoeists, requiring a float plane out of Thompson to drop you off and pick you up at the end, the Seal is highly inaccessible. The beautiful tundra landscape and tall canyons make for a one of a kind trip. Most often paddled in 3 weeks, the route goes all the way to the Bay of Churchill with the most adventurous paddlers making the 20km journey along the bay to the town of Churchill. With it’s northern location come northern dangers, the black bears of the south look mighty tame compared to the polar bears you will likely see roaming the shoreline as you get closer to the bay. Do not let that deter you though, the Seal River may very well be the most incredible canoeing experience in the world. Winding through lakes and thick boreal forest, The Whiteshell River is one of the best ways to experience the vast Whiteshell Provincial Park. The Whiteshell River is a longer trip at around 5 days, this makes it perfect for the beginner/intermediate flatwater canoeist. With many of the Whiteshell’s lakes having succumb to cabins and lodges, this route takes you away from all of that into the backcountry depths of this beautiful provincial park. If you have experience at shorter distance trips and want to experience a longer stint in the bush, Twin River Travel will be running the Whiteshell River July 13th-17th, book now! Price is all inclusive, including transport from Winnipeg, all equipment, food, and professional guide.